In 1962, Ferrari manufactured a series of sports cars called the Ferrari 250 GTO and sold them for $18,000 each. Only 39 were manufactured in total. When access to something is restricted, by being scarce or exclusive, the perceived value and demand for it increases. We always crave what we can’t have. We want to be the only one to own that rare item, or get admitted to that private club. And we’re willing to pay big. Facebook wasn’t the first social network but, because they launched as an exclusive club for students of select universities, everyone wanted in. By the time they opened up to the public, they had a massive queue of people waiting. The Ferrari 250 GTO is 50 years old. As a car, with its outdated technology and safety standards, it has almost no value. But because they are so scarce, they have immense value as a collector’s item. Scarcity and exclusivity are powerful psychological methods of persuading people to buy. Customers sitting on the fence will be more inclined to purchase when they learn that the product they’re looking at might not be available to them. While it wasn’t planned, it certainly worked well for Facebook and Ferrari. When implemented correctly, you too can use these methods to boost sales and increase conversions. We’ll look at 6 ways you can do this on your site. When you shop on Amazon, you might have noticed a large green sign telling you how many units are left in stock. In this example I’m shopping for a t-shirt and, when I click on one I like, I’m told there are only 4 left. I’m already interested in the shirt, but the limited quantity makes me think there’s more to it. The effectiveness of this strategy increases with the need for the product. For example, if you want to travel somewhere and you’re looking at tickets online, a message telling you there are only 3 seats left for a certain flight forces you to make a decision quickly. If you don’t book it, someone else will. Limited quantity implies that you can only use this strategy for physical products, but that’s not true. Appsumo has a digital product called the Monthly 1k course. It’s basically an online course that can be accessed by any number of people, but Appsumo uses scarcity to nudge people to buy. Here you can see a sign saying there’s only 276 ‘spots’ remaining. You can do the same thing for your digital product or SaaS business and artificially limit the supply. However, you must be careful when doing this. If you tell people you have only 100 spots then stay true to your word. Stop selling your product after that 100 because, if you don’t, you’ll get called out and people will lose trust in you. Wait, if there’s no stock left of an item, how are people supposed to buy it? Actually showing that a certain item is not available can help if that item comes with alternative options that are available. Clothing comes in various colors and sizes and, if one size is sold out, it makes the other sizes more desirable. Threadless does this well. 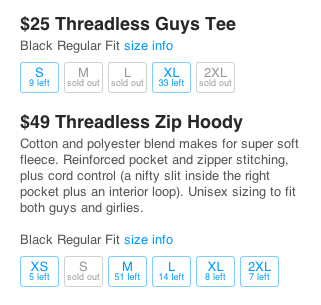 For each shirt, they show you what sizes have sold out and how many are left of the remaining. You can’t purchase the sold out options even if you wanted to. Going back to the Appsumo example, you’ll notice that the limited ‘spots’ apply only to the Bootstrapper payment plan. Keeping this plan up on the site after all the spots are gone, with a ‘Sold Out’ sign, will serve as a reminder to visitors that they should get the Entrepreneur plan before that too sells out. Scarcity doesn’t mean your product has to be in limited quantity. High demand for a product can create the same feeling as actual scarcity does, even if there are large quantities of the product. When Apple announced the launch of the iPhone 5S, it was obvious that there would be huge demand for it. Apple has perfected supply chain management, so selling out wasn’t very likely. That didn’t stop people from camping outside their stores 4 days before the actual launch. Hotels.com shows you how many people are looking for hotels on their site at the same time you are. First they show you the number of people searching the same day, establishing an overall demand for rooms on their site. Then, when you click through to a hotel, they actually show you how many times that hotel has been booked recently and how many people are looking at it at the exact same time. On Ruby Lane, you can see how many people have the product you want in their cart already. It urges you to buy the product before they can complete their purchases. The drawback of this approach is, if no one has the product in his or her cart, it looks like the product is unwanted. Showing that your products are in demand works as social proof, but it also lets shoppers know that if they don’t buy now, someone else will. In the early days of Facebook, to qualify for an account, you had to be a student of Harvard. This almost implied that if you weren’t good enough to get into Harvard, you weren’t good enough to get into Facebook. They piggy-backed on Harvard’s reputation as an exclusive school to build their own exclusivity. While Facebook was restricted to Harvard, it wasn’t a big deal outside the school. As they expanded to other elite schools, students of those schools became qualified to join the exclusive club. Now they started getting attention everywhere as people realized they too might be able to qualify for the site soon. While Facebook eventually dropped its exclusivity, Quibb, a network where professionals can share news, doesn’t look like it will. They launched in 2013 and only allow qualified professionals to become a part of the network. You have to go through a manually reviewed application process and only 38% of all applicants get in. You may think that flaunting their elitism might turn people off, but the Quibb network is so strong that it only makes you want to work harder to get in. They have members from over 17,500 technology startups and companies, justifying their exclusivity. Like Quibb, if you are pre-qualifying people to use your product or service, make sure you can justify it. No one likes being told they don’t qualify because they are not good enough. Quibb has solid and valid requirements for qualification, and that explains their success. In the movie ‘Up in the air,’ George Clooney is obsessed with collecting air miles. Finally, when he crosses the 10 million-mile mark, he receives a personal metal card with travel perks that most people dream of. It’s an elite status like no other. In a survey conducted by Deloitte, it was found that businesses with a loyalty program were 88% more profitable than businesses without. Customers who enrolled in these programs spent four times as much as regular customers. Being able to access restricted perks and deals makes customers more engaged. As part of the inside group, they become more emotionally invested in your company. They spend more on your site so that they can keep their benefits and remain a part of your select membership. A loyalty program is one way of creating this membership. Customers who spend more on your site receive points or ongoing benefits. The more they buy from you, the more you give them in return. You can also create a paid membership program on your site, where people pay a subscription fee to receive ongoing benefits. Amazon Prime is an example of this. Instead of giving out loyalty points to people who buy more products from them, Amazon lets any one access perks by paying a yearly fee. On April 1, 2004, Google launched a new product called Gmail. At the time, Hotmail and Yahoo Mail were already established, but they had space limitations. Gmail was said to be the next big deal in e-mail, with a whopping 1GB of space! Everyone was curious about it. The space seemed like a game-changer, but there were also rumors about Gmail making money by reading e-mails and creating ads. It became the talk of the town, but most people couldn’t even access it. Gmail was being rolled out slowly, on an invitation-only basis. Only someone with a Gmail ID could invite other people to the service, and their invites were limited. Gmail had become an exclusive club, and account holders were the all-powerful gatekeepers. Everyone wanted an invite and soon people started selling one online for $150 and more. Gmail slowly kept increasing the number of invites till they opened up to the public in 2007, almost three years after they launched. By then, demand was huge, and Yahoo Mail and Hotmail were long forgotten. Personal invites work because they make the person receiving the invite feel special. Try this on your site by reaching out to your top customers and subscribers and personally inviting them to take part in deals and product launches. Let them know how valuable they are and that they are part of a select few you have chosen. There’s nothing morally wrong with using scarcity and exclusivity to persuade people to buy from you. You’re simply letting shoppers know that your products are limited and that they should make the purchase sooner rather than later. It only works if they are actually interested in your product in the first place. However, you need to make sure not to overplay your hand. Creating exclusivity without any valid reasons will turn people away from you. Implying that your products are limited when they aren’t will erode customer trust. The last thing you want is to undermine all that trust you’ve built up over the years. If you’re going to restrict access to your product, let people know why and stick to that. How are you using scarcity and exclusivity on your site? Has it made an impact on your conversion rates?